The new narrative emerging draws heavily from the Sahwa (Awakening) in Iraq, in which Sunni tribes from the western province of Anbar took up arms against, and eventually defeated, the Al Qaeda insurgency that followed the US invasion and occupation of that country. Western and Gulf media are now attempting to reinvigorate the rebels’ public image by concocting a portrayal of brave “moderates” taking on the extremists within ISIS. Yet contrary to the Syria-Sahwa narrative, the vast majority of opposition forces, as much as one can generalise, have in fact been shown to share far more in common with their extremist equivalents than they have differences, particularly in regards to their reciprocal – and sectarian-laden – religiopolitical ideologies. According to Western and Gulf propagandists, Jabhat al-Nusra ostensibly represent the “homegrown” Syrian Al Qaeda branch. Whereas in actual fact, the claim is entirely false; JaN’s militia hold a distinct foreign contingent and many of its commanders have also been found to be of foreign descent – particularly Iraqi. Jabhat al-Nusra, therefore, should be correctly viewed as a semi-Syrian militia at most, built and sustained by ISIS and its former incarnation: the Islamic State of Iraq, (ISI) also formerly known as Al Qaeda in Iraq (AQI). The ideologically aligned Salafi-Jihadists of Ahrar al-Sham, Jabhat al-Nusra, and more recently ISIS, have formed the spearhead of the insurgency throughout the entire Syrian crisis, leading offensives against Syrian army installations, whilst also having enough manpower, funds & materiel to attack, encamp and militarily fortify civilian areas across the country. Most notably in Raqqah, which has become a virtual Al Qaeda statelet under the control of either Jabhat al-Nusra or ISIS. 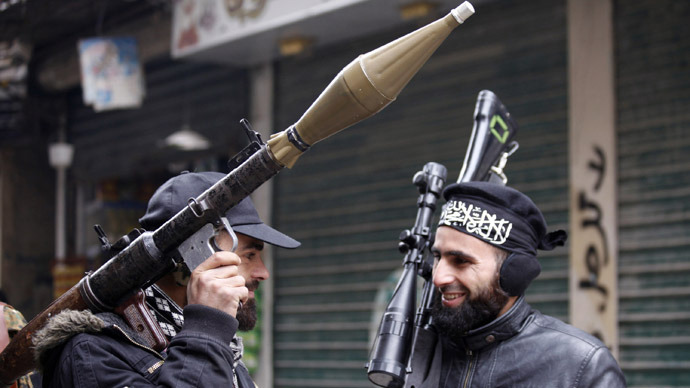 Examples of the dominant role fundamentalists have played in the insurgency are abundant, during an interview with TIME magazine, Ahrar al-Sham fighters – who, as we have seen through a plethora of evidence, are inextricably linked to Jabhat al-Nusra – freely admit they were planning a violent insurgency in Syria well before any peaceful protests occurred in 2011, and that recruits with underlying sectarian agendas made efforts to sanitize and mask their true Jihadist cause during the earlier phases of the conflict in order to win over the Syrian population. Whats more, a recent report in the National relayed much the same admissions from supposed “FSA” rebels operating in the south of Syria around Dar’aa. “They [JaN] offer their services and cooperate with us, they are better armed than we are, they have suicide bombers and know how to make car bombs,” rebel sources went on to say that “the FSA and Al Nusra join together for operations but they have an agreement to let the FSA lead for public reasons, because they don’t want to frighten Jordan or the West,”. During the interview rebels further elaborate on the efforts made to boost the public image of the western-backed imaginary moderates saying that “operations that were really carried out by Al Nusra are publicly presented by the FSA as their own,” and that supposed moderate FSA fighters “say that Al Nusra fighters are really from the FSA to enable them to move more easily across borders,”. The reports bolster earlier analyses that contradict the dominant narrative, often dismissed as “conspiracy theory”, which indicated such actions were being undertaken, and that the armed groups responsible for the initial violence in March-April 2011 were indeed religious fundamentalists, not the secular “freedom fighters” endlessly lionized by the lackeys of western governments and media. Such candid rebel admissions once again expose the falsehoods that liberal opportunists rely on when blindly repeating the Imperialist narrative of a peaceful protest movement simply morphing into an Al Qaeda-led insurgency. In reality, the generally small and legitimate protests calling for reform were used as a fig leaf by Syria’s various internal and external enemies to hide the extremist-led militant insurgency they were orchestrating and colluding with. As evidenced in numerous interviews and statements from Abboud and Alloush, the Islamic Front is not by any stretch of the imagination a “moderate” force opposed to JaN, ISIS, or Al Qaeda ideology in general (unless one utilises the doublespeak of the US State Department when describing their “moderate” Wahhabi-Salafi monarchical clients in the Gulf). Ahrar al-Sham, Liwa a-Islam and other various proto-Salafi militia operating under the umbrella of the Islamic Front have repeatedly fought alongside Jabhat al-Nusra and ISIS, and taken part in offensives that have targeted towns and villages on the specific criteria of the sect of the civilian inhabitants. The massacres committed upon the civilian residents of Latakia provide just one recent example of such sectarian barbarity – committed not only by the extreme elements, but with the full cooperation and participation of supposed moderate “FSA” militia. A more recent example of the Islamic Front cooperating with its Al Qaeda-affiliates came in December, when the IF took part in the attack and ensuing massacre of civilians in the workers district of Adra, Damascus – another rebel war-crime almost totally omitted from western media, regardless of the fact the BBC’s chief foreign correspondent was a mere 20 miles away while the massacres were occurring. When framed in the correct context, it becomes clear that the vast majority of rebels in Syria are in fact ideologically allied to the very Al Qaeda affiliates the media is trying to portray them as opposed to. A recent communique from the political head of the IF, and leader of Ahrar al-Sham, Hassan Abboud, was disingenuously portrayed as a Islamic Front “warning” to ISIS. Opposition-friendly media outlets and analysts are in effect conflating the Islamic Front with imaginary “moderates” and in turn attempting to portray them as ideological opponents to their more extreme Al Qaeda counterparts. This narrative is turning reality on its head, as Abboud’s recent statement is actually a “warning” against discord with ISIS. Abboud encourages the Syrian population to treat the Muhajirin (foreign jihadists busy murdering Syrians) “kindly”, and further encourages ISIS to emulate the “more healthy” manner of their supposed “home-grown” incarnation Jabhat al-Nusra. Accordingly, one can safely conclude that Abboud, Ahrar al-Sham, Liwa al-Islam, and the various Salafi militia operating under the umbrella of the Islamic Front – the largest militant force of the opposition – have close to zero ideological disparity with ISIS or JaN. Even if what seem to be inflated reports of discord and infighting between the Islamic Front and the supremacist ideologues in ISIS were to result in a considerable loss for the latter, it would simply be replaced at the top of the fundamentalist food-chain by the next militia willing to impose its barbarity and coercion in the most effective way. This is ultimately the inherent nature of fundamentalist militant insurgencies, they are designed, indoctrinated, equipped, and funded to impose upon states and peoples through murder, coercion and fear, not through the appeal of a popular political doctrine and the mass support of the people. The simple facts that the insurgency as a whole is under no central hierarchy, and holds little to-no support inside Syria and is therefore susceptible to becoming reliant and subordinate to its foreign patrons, are clear indications that it will not be cohesive, regardless of the varying shades of fundamentalism the dominant groups have attempted to enforce. The historical record of Western-GCC-backed insurgencies in the Arab and Muslim world provides copious amounts of evidence to show that invariably the United States and its Saudi partners have always utilised, fomented, and sponsored reactionary forces to meet geopolitical ends, particularly when subverting or attacking nationalist governments that refuse to abide by the Anglo-American capitalist order – with disastrous consequences for the countries in which the fundamentalist proxies are set upon. One needs only to glance at the very recent history of Libya to negate the establishment falsehood that if the Syrian government had been overthrown quickly the fundamentalists would not have gained in strength. Again, this is turning the historical record on its head, as the joint NATO-Al Qaeda war on Libya has once again shown; the swift overthrow of a state’s government and leadership inevitably results in reactionary fundamentalists taking advantage of the power vacuum left behind. The US-Saudi-backed insurgency in Afghanistan during the 1980′s, which fought against the Soviet-backed Communist government, provides perhaps the definitive example of the type of proxies the United States and Saudi Arabia choose to employ to destroy target states. As with Syria and Libya, the original “Afghan Arab” insurgency – which helped to create and empower Al Qaeda, Bin Laden, Hekmatyar, the Haqqani network and a host of other fundamentalist militancy – was wrought with infighting, extremism, warlordism, and reaction, this trend has continued in virtually every state the US and its GCC partners have targeted for “liberation” via jihadist proxies. Perpetual infighting evidenced throughout the Syrian insurgency is in fact a result of the long-standing fragmentation of the various opposition forces, their varying degrees of fundamentalism, and the battle to win influence, arms, and funds through foreign donors and exploitation. The evidence-free narratives of supposed existential disparity between what actually represent ideological allies, the patterns of ever-changing nomenclature and rebel rebranding, and the efforts to scapegoat the most overtly extreme elements for the systematic crimes of the opposition as a whole, are nothing more than public relations exercises, designed to whitewash the massive crimes of the “rebels”, whilst extricating the Western Elite and their GCC partners from the criminal act of sponsoring extremists for geopolitical ends.